Tonight I made a special trip to visit my personal archives. While rooting around trying to find a couple old things that I was looking for, I happened to come across an old magazine I knew that I had, but had forgotten where I put it in one of my recent moves. It is a rather interesting magazine as it was glossy and covered the arts in Calgary. As best I can determine it had a very low circulation and was active during the mid to late-1980s. It was called Last Issue. This was the Winter 1987 issue (based on what is inside it is the 1986/1987 issue). The High Performance Rodeo ends this Saturday, the first day of February. It also is the 28th iteration of the Rodeo. As I opened the magazine to investigate what was inside, I found an image on the inside front cover which lists a lot of people involved with the High Performance Rodeo. One Yellow Rabbit and the High Performance Rodeo both have their roots in dance. Here, the University of Calgary, Faculty of Physical Education was doing an inter-disciplinary sponsorship of this young troupe of performers, in a three day performance entitled Red Dress Journey and other dances during the year that the High Performance Rodeo was formed. 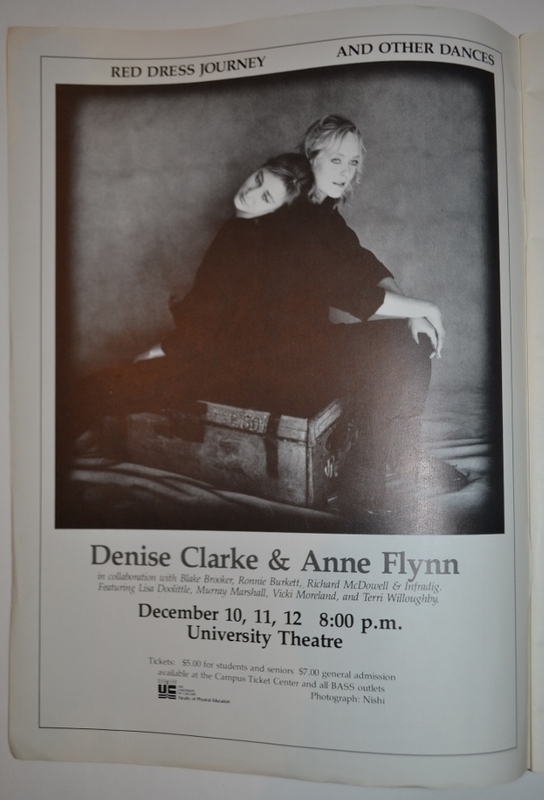 It is interesting seeing the names Denise Clarke, Anne Flynn, Blake Brooker, Ronnie Burkett, Richard McDowell & Infradig together with Lisa Doolittle, Murray Marshall, Vicki Moreland and Terri Willoughby. What a great group of people who all played a role in forming the High Performance Rodeo. This occured when things were just starting to happen for the two organizations. Kudos for the Faculty of Physical Education for the foresight to recognize this group for it was to become, way back in 1986 before the Olympic Arts Festival brought culture and sport together. These type of partnerships are always interesting to see. There seems to be a story that has gone largely unreported in the city. Maybe more correctly – not at all. This is entirely understandable, as this did not happen in the city. Lucky for you dear reader (I don’t know why, but I feel like Miss Manners saying this). You get to find out about this project through me. That being said, it does fall within my research scope and does very much interest me. A few of the more obtuse things that I am interested in – Nuit Blanche, The House Project, Arbour Lake Sghool, Wreck City, Phantom Wing, Solar Flare, do-it-yourself projects, public art and building of community through art. This is a continuation and morphing of these stories. 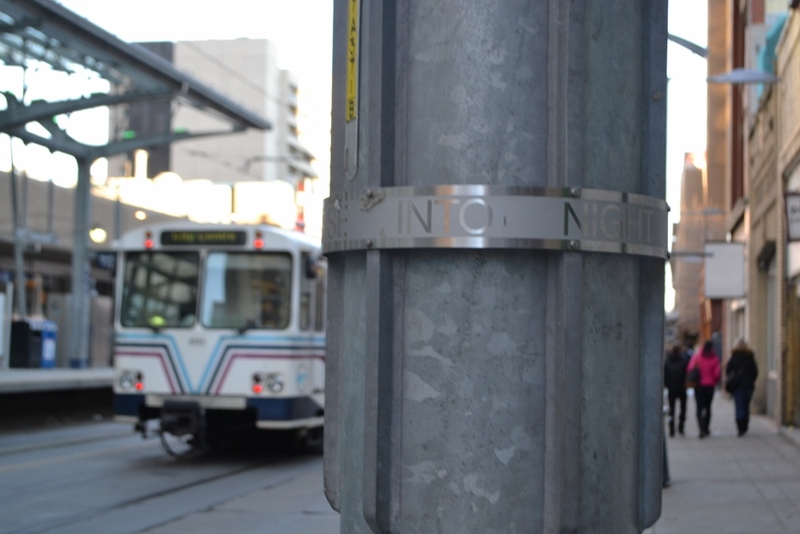 Recently, I wrote about the Solar Flare installation which was sponsored by Downtown Calgary and is currently installed along Stephen Avenue Mall. It should be up for another month or so. This Kentucky installation involves the same two artists – Caitlin r.c. Brown and Wayne Garrett. They have just installed another project which was unveiled at a Ball, about ten days ago. This time in Lexington, Kentucky. 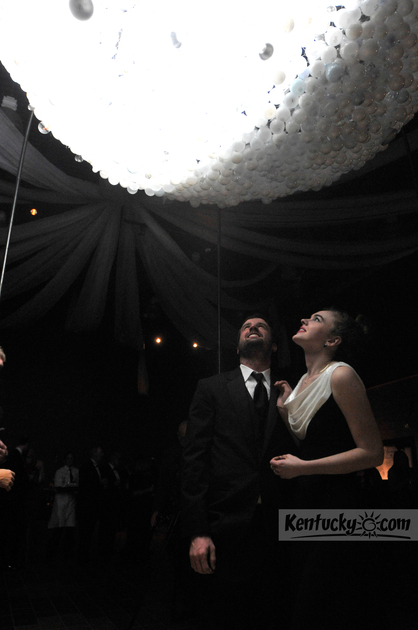 It, like other similar projects, is a short-term installation that will be installed outdoors during the Lexington Art League’s light-based festival Luminosity during February 21 through March 31. Those who look at this picture will recognize how a very well-received installation during Nuit Blanche’s initial iteration entitled Cloud, has morphed into new directions over time, while still retaining a certain element of the original conception. This work is also interesting for a different reason as it appears as if this involves much more collaborative efforts than any of their previous efforts. When I think of large scale collaborative efforts to produce installations, I cannot help but think of some major installations that Calgary artist Shelley Ouellet undertook during the 1990s and into the 2000s and still informs a certain amount of her art-making practice. Specifically, I think of the large Mount Rundle work which I believe was shown at the Whyte Museum in Banff and/or the Entomology piece (I can’t remember exact titles, even though I helped collaborate on both pieces) that was shown at the old Nickle Arts Museum. If I recall correctly, either one or both pieces are now in the collection of either the Art Gallery of Alberta in Edmonton or alternatively acquired by the Alberta Foundation for the Arts. I would expect to see one of these pieces (or at the very minimum a smaller-scale installation-based work of some sort by Shelley Ouellet) in the Glenbow 199os show that Nancy Tousley is curating and will be opening in the next week or two. This Kentucky work would seem to be following in the tradition of installation-based and collaborative space that Shelley works in. This is evident through the collection of large quantities of burned out and live incandescent light bulbs required for the installation(s) to be built, which has always been there. In this case, based on what little information I could deduce, I suspect the Lexington Art League was helpful in directing (or encouraging) the installation and fabrication part of the project towards this direction as well. Based on my interest in economic development and history, it is quite possible that this may be a community characteristic of Lexington. This could potentially be rationalized by the long agricultural history in the area which dates to pre-industrial and slave-trade times (with the largest concentration of slaves per capita AND free blacks) combined with its long cultural legacy as well. If so, these factors would necessitate that the community would need to work collaboratively for a common purpose. It will be interesting to see if this continues in further iterations as the type of work lends itself to a collaborative effort and a larger community buy-in. This is more of a footnote for me, but an interesting one nevertheless. My congratulations go out to both artists. Over the weekend Phillip Gefter’s article in the New York Times from two days ago, entitled The Next Big Picture; With Cameras Optional, New Directions in Photography crossed my desk. I would argue that Tyler Los-Jones’ installation-based work entitled The way air hides the sky should also be considered as dealing with photography in an abstract way, even though this may not be the artist’s original intent. For background to further discussion, I want to talk about the camera obscura. Utilizing a naturally occurring phenomenon, the camera obscura has been around since we lived in caves and tents – although it may not have been recognized as such until sometime later, probably in the middle ages. It is so rudimentary, it is how our eye sees objects. Our brain automatically corrects the orientation of the image. Pinhole photography and the camera obscura share a lot of the same principles. I have inserted a schematic which shows the process of how it works below as it relates to drawing. The principles are still the same. A single person is standing in the sunshine on one side of the yard. The photographer steps into a completely darkened room on the other side of the yard and closes the door behind him/her. Between them is a wall with a small hole in it on the side facing the person standing in the sunshine. After the photographer’s eyes adjust to the darkened room, the photographer notices that on the far wall across from the small hole is an image of the person standing in the sunshine. The difference is that the person is upside down and appears to be standing on their head and can be viewed in real time. 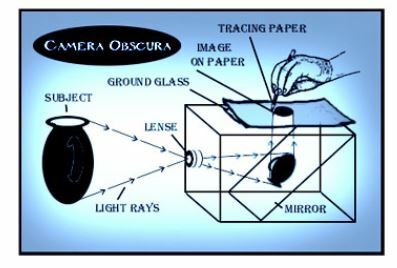 This is the basic technology for the camera obscura – simplified greatly of course. I have not bothered to explain how the image is captured. One of the many advances in photography was the use of mirrors. Now we have mirrorless cameras. This is a relatively new innovation and young technology and is viewed as kind of a big deal. Most likely this is where the marketplace will be going in the next couple years. Watch for more significant advances here in the near future. As a result, it is fair to say that the technology now is very much different and much more complex than it once was. Having said this, any person can build their own camera and take photographs using the rudimentary camera obscura process and there are many that do. In fact, there is a small group of dedicated photographers that do just that in the city and area and there has been for a while. In some ways I would suggest that is a backlash against technological advances, retaining past knowledge, combined with the honesty of doing it old-school – although I am sure tat each person does it for their own personal reasons. In fact I wrote a review published in Calgary’s FastForward last year during the Exposure Festival about two of these people that do pinhole photography – Diane Bos and Sarah Fuller. To boil down the technology of photography even further – photography is about capturing light (and the absence thereof). Getting back to the New York Times article. The article is in response to a new show that will be opening later this week at the International Centre for Photography in NYC. The ICP show talks about the important period starting in the 1970s to present day. During this period the boundaries surrounding photography began to blur as a result of conceptualism and the inter-disciplinary nature of photography that is not uncommon now. The shift of focus from fact to fiction, and all the gradations in between, is perhaps the largest issue in the current soul-searching underway in photography circles. Questions swirl: Can the “captured” image (taken on the street — think of the documentary work of Henri Cartier-Bresson) maintain equal footing with the “constructed” image (made in the studio or on the computer, often with ideological intention)? There is a lot more in the article and it is well worth the read for anyone interested in photography. I would suggest that with it being the month of photography shortly, this article should be required reading before stepping foot inside any exhibition space. You don’t have to agree or disagree with the writer or any of those quoted – just be aware and use it as food for thought. As stated above, the use of mirrors is considered to be a significant innovation in the advancement of photographic technology. So was the use of lenses; the concave and convex forms that they took; digital image capture; and many other advances. For our purposes however, I am most interested in the use of mirrors. In Los-Jones’ installation mirrors are also important. The primary image in this installation is of three pieces of what I assume to be old growth timbers, painted blue on one end. To properly view the image, one must use the mirrors stacked against the far wall or alternatively move to a far extreme in the window and see it from the side. The image generally faces away from the viewer and is attached to the backside of what looks like a packing crate and moving blankets. There also are what is assumed to be a large scale photo of water and nature-based wallpaper rolled up sharing the same space. 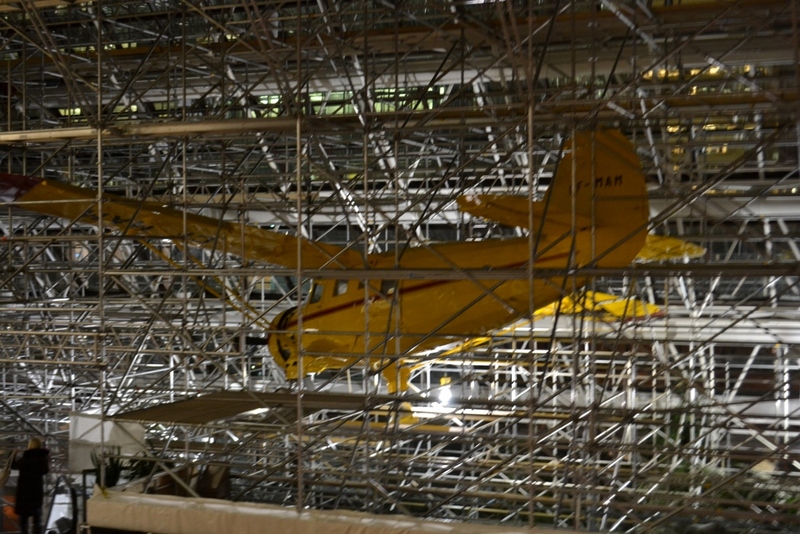 The installation gives the impression that it is like a display window that is being set up and those putting it together have left for a short coffee break. My point is that in this installation the mirrors are important. It is through using these mirrors one gets a view of or glimpse of the installation. As it is with photography, so it is with this work. Some of this installation is photo-based. This also ties in with the photography theme, although this is more studio-based and as Bajac states, is moving more toward fiction. Overall this work fits within the greater context of the other three artists showing in the main space. All are dealing with the concept of utopia – a theme that underlies all the works on display. If I am able, I would like to go. I am previously familiar with his work, but this appears to potentially be a new direction. I would be interested to hear what he has to say. I am sure this has never happened to anyone else. You walk past something 1000 times or more over the course of many years. You never notice that something has been there all that time, then for whatever reason you notice it and realize how oblivious you have been all that time. Yup!!! That was me yesterday. I mentioned my find to a colleague that I saw at a function last night. I described them. I even mentioned the artist’s name. She indicated that she should be aware of them. She drew a blank as well. So I informed her that she should check my blog in the next few days for more info. So here is the public service announcement. I am assuming that the two of us are not alone. We look at public art. We look for it too. If we have not paid attention to them, chances are it is not even on the radar screen for others. Public art is a curious thing. Sometimes it is bright, flashy and you can’t help notice it. Sometimes it is not. Sometimes it is ephemeral. This one is the one that is easy to miss. The City of Calgary has a 1% for art program. Just like many other municipalities, provincial and state governments, and the federal government as well. I have written about it before. I am sure I will write about the 1% for art program again. Briefly, the program designates that capital project budgets over $1-million should allocate 1% of the capital budget toward public art. This public art is sited and embedded in close proximity to the capital project that the 1% relates to. For more info, click here. I realize that the above is very much a complete simplification of the process. In talking to those involved, I believe that in Calgary there has never been a case where new public art related to this program has gone over the 1% budget – not even close. There is a seedy block in the downtown core that has been quite seedy for a very, very long time. It is along the Seventh Avenue C-Train line. Any long-term resident that has spent any amount of time in the downtown core, will know exactly what strip I am talking about, even though it is not nearly as seedy as it once was. Yesterday I walked along that strip. It is directly across from both Art Central and the new Telus Sky development. It also borders where the former MaVA project was to have taken place, before the deal for MaVA fell apart sometime during the last year or two. If someone who reads this has info on the MaVA project I would like to talk, and I would be very interested in receiving documentation relating to it. But I digress. Regardless of that, I stood at the intersection waiting for the light to change. I have stood at this intersection many, many times since 2007. I stood there when I had a dog that used the shrubbery in the area and I am positive that he even used the lamppost where this artwork was found to do his business when I had a place across the street in Art Central. Do you think I ever noticed them before? Nope. Not even a clue. Today, I took photos. The work is text based so I recorded what the text states. Each work is on a two inch (approximately) high on a stainless steel band that fully surrounds each light standard and/or power pole. One must circle the entire post to read what it says. There are six bands attached to six different light standards on this block. The same font is used on each band so I assume that they were laser-cut. All six pieces were attached to each lamppost at eye level and located on the shady side of the block – between the Hyatt and the Bay. Each band almost as if it is an incomplete fragment of a thought. I did some further research and from sources I believe to be dependable, there should be four more located near City Hall for a total of ten pieces. As a result, I walked the 7th Avenue corridor between the Bay and East Village on both sides of the street and then walked around City Hall and Olympic Plaza as well. I could not find them. I wonder whatever happened to the other four poles that the artist has indicated should exist. Maybe I am blind and can’t see them, but at least I now know that they should exist – somewhere. Yet another mystery on my hands. Now to find them. Last night I attended the well-attended opening at the Esker Foundation. There were three interesting shows in the main space featuring (as one encounters them) – Peter Von Tiesenhausen, Tobias Zielony, Cedric Bomford. As a group with different approaches they all are well-selected and work well together in the same physical space. 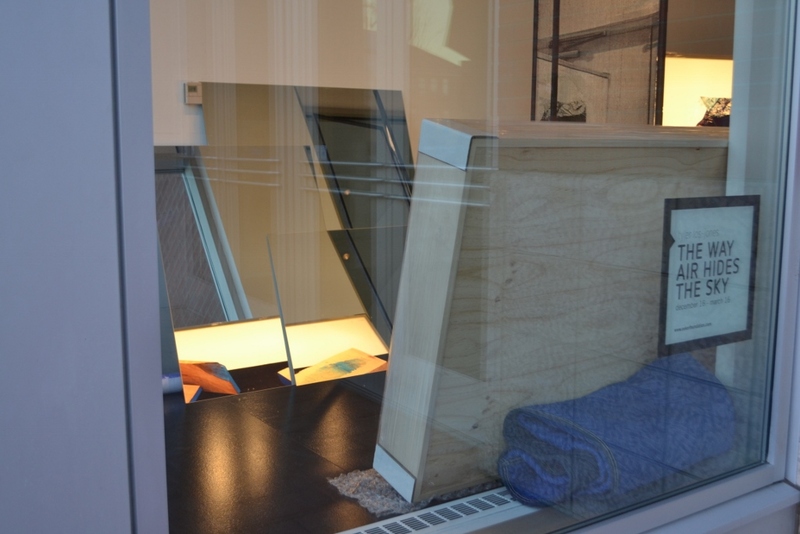 Also featured in the Project Room (a display window space on the main floor) – Tyler Los-Jones. As expected, given that this is the EXPOSURE: Calgary, Banff, Canmore Photography Festival will occur during the month of February, two of the featured artists deal with traditional photography – Tobias Zielony and Cedric Bomford. However, I would argue that Tyler Los-Jones’ installation-based work entitled The way air hides the sky should also be considered as dealing with photography in an abstract way, even though this may not be the artist’s original intent. If time allows, and I still have the inclination, I would like to explain why at a later date. My intent today is to write about Cedric Bomford and architecture. I am not an architect. However, I do enjoy looking at built-spaces, as stated before in this blog, I am however a big fan of Brutalism. That is about the end of it. 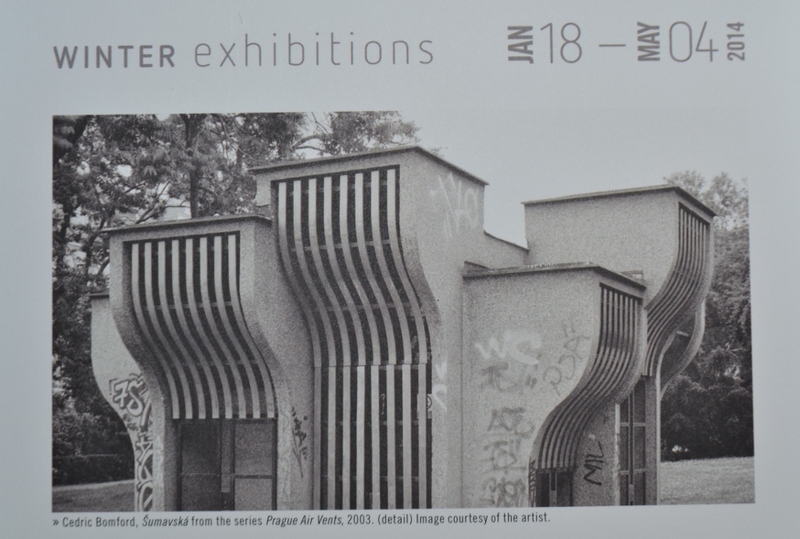 The work of Cedric Bomford on display at the Esker, is a series of 15 large black and white photos of air vents connected to the Prague underground metro system. I must assume based on the date of the one photograph illustrated in the catalogue (seen above), that this work must have been completed shortly after his graduation at Emily Carr University. This in itself is interesting given the strong long-standing and well-conceived photographic tradition that is found in the lower BC mainland and Vancouver in particular. With that in mind it is interesting looking at these works with an historical perspective. Naomi Potter indicates in the catalogue essay that these structures were built during the 15-year period of 1975-1989. A bridge connected to the Langevin Science School (that will soon be remediated) amongst others. Recently I have spent time in the downtown core. When there, I often look at the interiors of office building lobbies as I pass through. 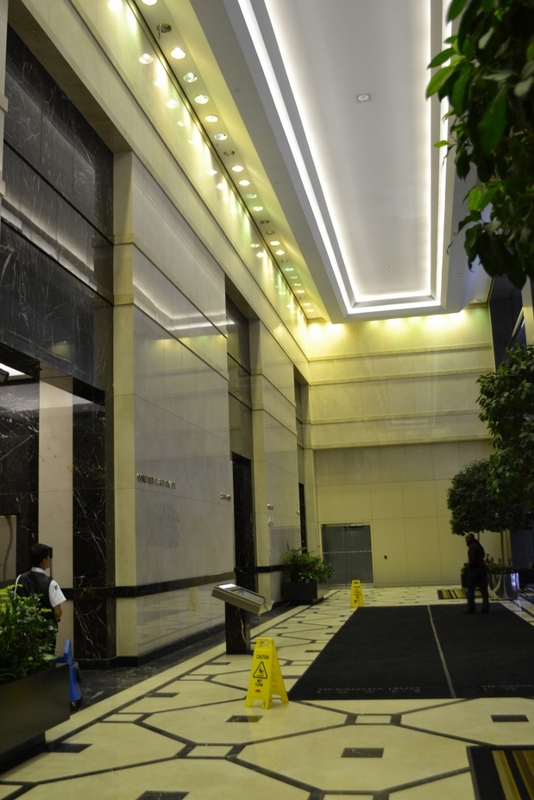 Attached is a photograph I took this week of the lobby of the TD Canada Trust Tower located at 421 – 7 Avenue SW. It is located on the site of the former Eaton’s flagship store in Calgary built in 1929 and some of the original Eaton’s façade has been incorporated into the exterior of the building, especially along the 8th Avenue side. When looking at this photo I also wonder if maybe some of the original marble floor was retained as well. 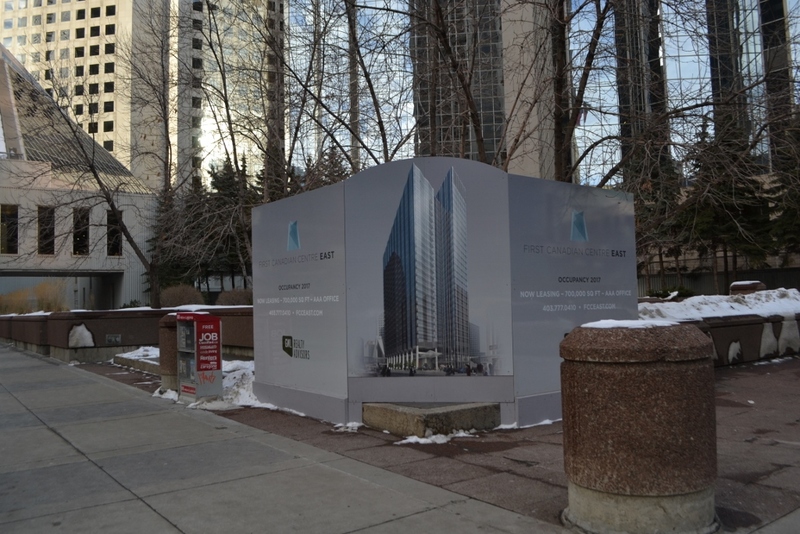 Regardless, this is an example of office tower lobbies in Calgary during recent history. This is not a particularly good photo and there is no reason why this lobby was selected over another, except that it illustrates my point and I happened to have a photo of it. As seen in this photo it can be described as minimal, cavernous and functional, with limited individual personality (outside of its unique architectural detailing) and a certain level of conformity (as in similarity to other office lobbies). I understand that architecture deals with the whole concept of form and function, just like it does with fashion and industrial design as well. Because of this, I should probably clarify my statement. I find it strikingly beautiful in its austerity of form and high finish. The functionality of its use is as a conduit to get those who use this building from the exterior building entrance to the elevator lobby which leads to their offices. Unfortunately the downside to this is that it does not encourage street-level vibrancy. It is not particularly welcoming or encouraging of people to stay in the environment for any length of time, with the exception of maybe the security guard whose desk is located there or the cleaner doing their job. There is only so much variation one can do in a defined physical space and often architects are not always the final decision makers in the grand scheme of things. Clients have a certain role to play as well and they also have to be aware of their own clients and the needs and requirements of the users of the space. As an example, this photo shows that there is no artwork, no public sculpture, very little seating and few signs of human presence (although we know it is there), only punctuated with few forms of greenery used to break the austerity. Similar statements can be said for Brutalism. Both are austere and pare down extraneous detail. Given that, I would be interested to fast-forward 20-30 years from now to see if this austere period in our current obsession (for lack of a better word) in our office lobby environments will be seen as dated. Also I would be curious to see if it meets with a similar distain for this style of minimal architectural interiors, as is the case for many with Brutalism now. Of course I cannot really speculate on that, as only time will tell. Finally. Something is happening here. Something amazing happened today when I was downtown. I saw signs of life in one of the most uninviting and forsaken courtyards in all of downtown. As I was waiting for the light to change, I noticed what I think must be a new sign on a street corner. Maybe I was paying attention. Maybe I was not. Either way it doesn’t matter. Dating back to the late-1970s/early 1980s this was the location of what was to be the tallest building (at 61 stories) in Calgary back in the day. When the economy came to a screeching halt in 1980/81, this building was put on ice for what was to be a couple years. It appears to be more like 30 years instead. The companion building First Canadian Centre was completed in 1982 and actually was the tallest building for only what I assume was a very brief period of time. It was surpassed by the Petro-Canada Centre, or Red Square as it was derisively known as in the fall-out period of the National Energy Project (or the NEP) which any long-time resident active in the oil patch will know about. Looks like things are happening there. Now we will have three tall buildings in a row. All under construction at the same time. Each on a separate block. Each making designs to be the tallest building in the city. Each on the same side of the street. Each on subsequent blocks – starting from Centre Street going west, Telus Sky, Brookfield Place and then this. The nightmares of traffic congestion in about a year should be horrendous.